boasting direct access to the beach of 6 thousand square meter available for the guests enjoyment. The hotel has 559 rooms and 69 suites all featuring balconies with ocean views, cable TV, telephones, voicemail, and private safes. For the guests entertainment the hotel has three temperature controlled pools offering bar services, water gymnastics and swimming classes directed by the Health Club, and children’s activities directed by the Kids Club. Also available for the guests use is a business center including 15 halls if different sizes, with rooms able to accommodate lectures, conferences, social events, and parties. 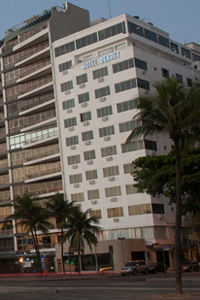 When would you like to stay at Sheraton Rio Hotel ? 1) Rates at the Sheraton Rio Hotel may not be valid during Carnival, New Years, Easter and other special dates.